TU/e has a Heat and Cold Storage (ATES) installation which is one of the biggest of its kind in Europe. The ATES has been executed with two central rings; a cold ring and a hot ring. Buildings can independently use heat and cold simultaneously, while heat and cold can be exchanged on the rings. 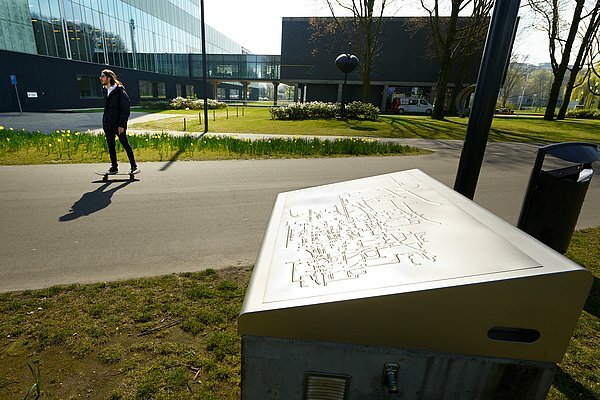 This is a unique feature of the installation at TU/e. A total of 70% of the built-up area of TU/e is connected with the ATES. The buildings forming part of the Campus 2020 projects are fully heated by means of the ATES in combination with a heat pump and low-temperature heating (in these buildings no natural gas is used for the heating). Likewise, the cooling of the buildings (high-temperature cooling) is realized by the ATES. In addition, the decentralized spaces where individual installations are used are fitted with presence detection and window contacts that can switch off the climate installation (induction ceiling) when the windows are opened. By storing heat and cold in the soil, TU/e annually saves some three million KWh on electricity and more than 450,000 m³ on gas. Watch the film about the ATES installation of TU/e.